The school year is about to end, and it has even already ended in some parts of the world. We all know what that means for senior high school students—prom night! I’m pretty sure these students have already found their prom dates, some would even go as far as making proposal videos and post them on the internet. Indeed, things do get utterly sweet and creative as prom night comes, and these teens would exert a lot of effort in asking the person they like to go with them at the prom. Even though the students are already aware of—and looking forward to—prom night, the school that is organizing the event will still need to use a form of advertisement tool to further promote and encourage their students to participate in the event. If you wish to go big and simply have your advertisement tool attached to the wall, then you can use posters templates for that. 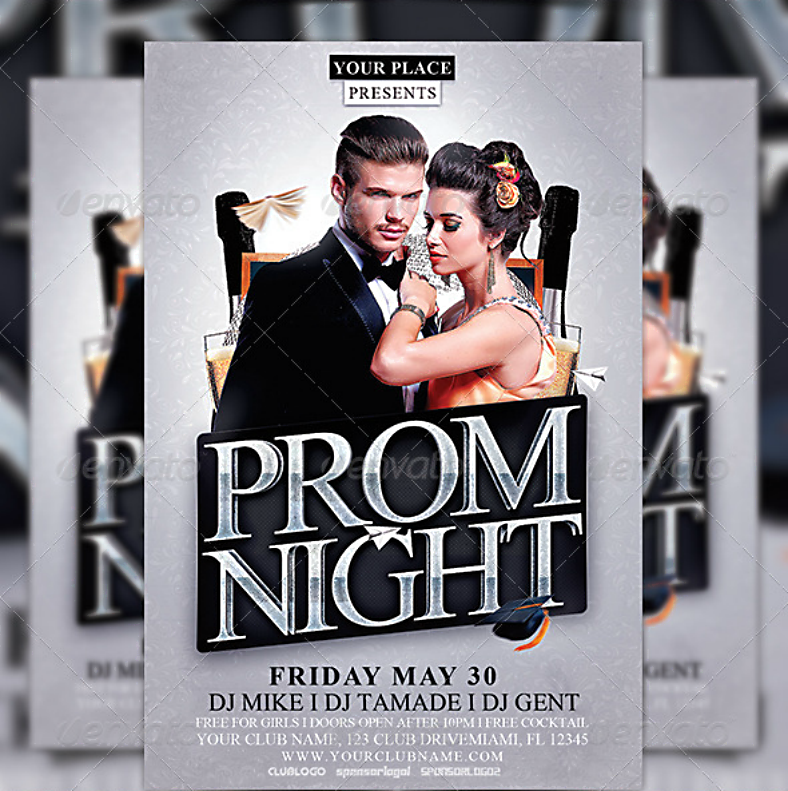 However, if you wish to connect with people and have your advertisement tool distributed by hand, then we have a collection of prom event flyer templates below for you to check out. If you ask us, flyers would be a better option since it initiates direct contact between the advertiser and the prospect, and you can also attach flyers onto walls and bulletin boards just like you do with posters. 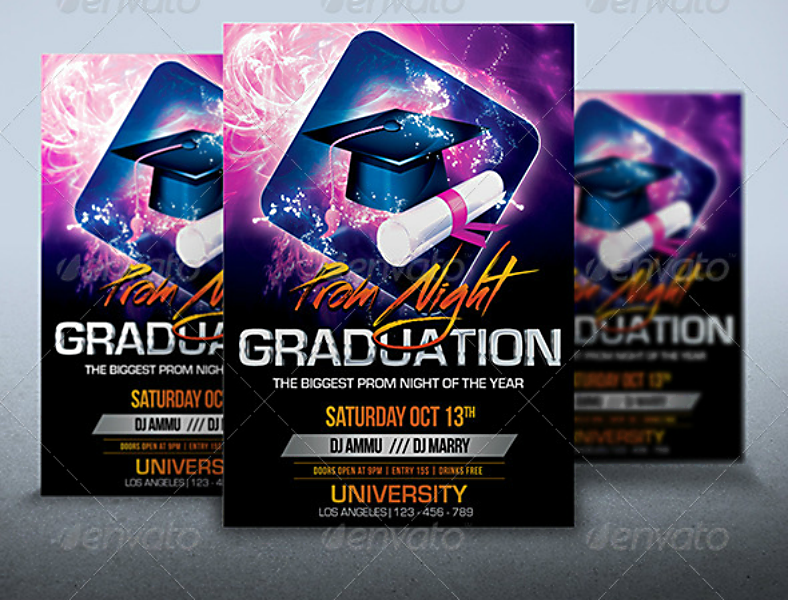 Check out this prom night flyer template which doubles as a graduation night party flyer, it features a clean yet modern theme that appropriately fits today’s generation of high school seniors. Use this template to make every senior’s night their most memorable one yet. 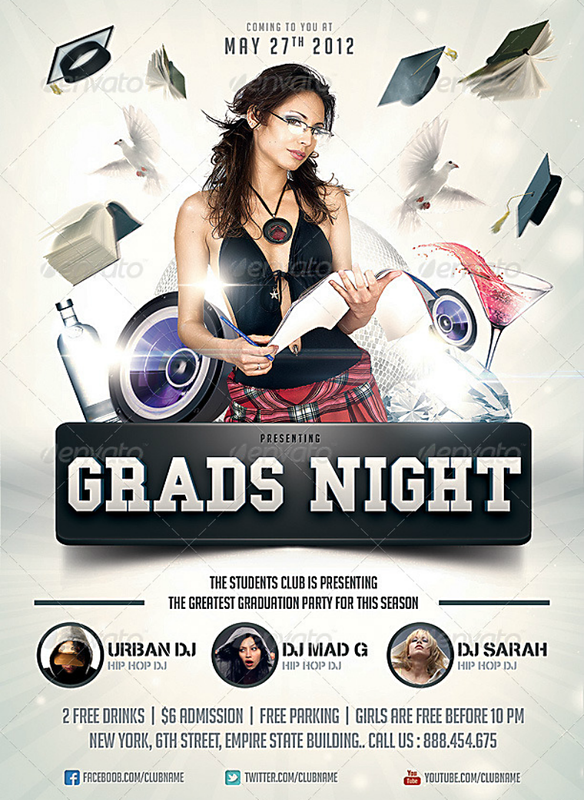 If you are planning on a reunion event, gathering together your former students on a very special night, then the flyer template above would be the ideal one for you. 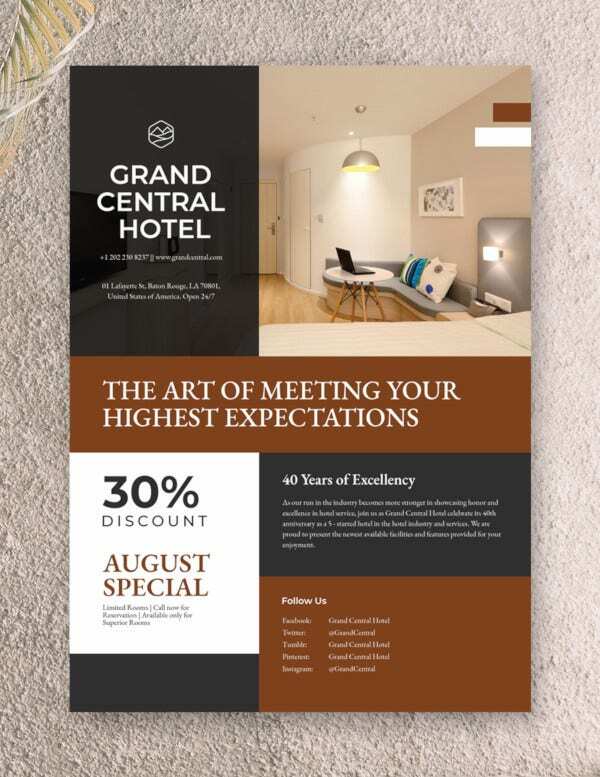 If you prefer a flyer design that leans more towards textual elements rather than graphical, then you may find the template above a good pick. This way, it makes the message on your flyer very clear even at a distance. Prom, which is a shortened term for promenade dance, is a semi-formal gathering in schools. Proms are attended by high school seniors with their teachers and are held near the end of the school year as another form of culmination activity for high school students aside from their graduation rites. Some institutions hold separate prom events, one for high school juniors and another one for the seniors, calling it junior prom and senior prom, respectively. But for most schools, they prefer the more traditional practice and combine the two, calling it junior-senior or JS prom. You may also see graduation flyer templates. For the male attendees, they will usually wear a black coat or any formal attire, often paired with a vest and a bow tie, others would even choose to wear something that matches the color of their date’s dress. The females, on the other hand, wear evening gowns or any long, formal dresses and accessorize themselves with various pieces of jewelry. Right before the pair leave for prom, they will give each other a corsage (for the ladies) and a boutonnière (for the guys). 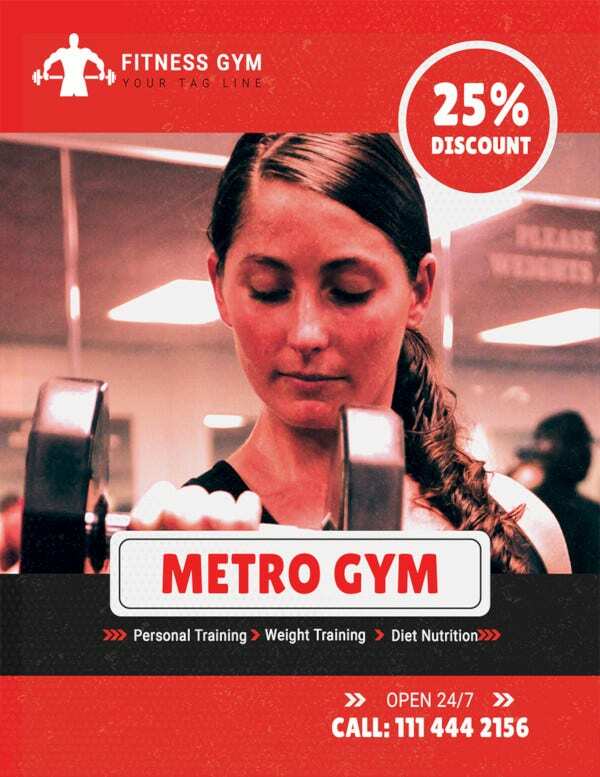 You may also see promotional flyer templates. What are Some Do’s and Don’ts During Prom Night? 1. First and foremost, DO have fun during prom night. Regardless if you have a date or not for your prom, you will always have your friends and you can still have fun. The important thing about prom is enjoying the night while it still lasts, considering that only a few days are left until a chapter in your life closes, so why not make the most out of it? You may also see professional flyer templates. 2. Speaking of making the most out of your prom night, why wait for the actual prom itself when you can always celebrate with your friends before and after the event? These are called pre-prom and post-prom celebrations, respectively, and DO get involved in them. 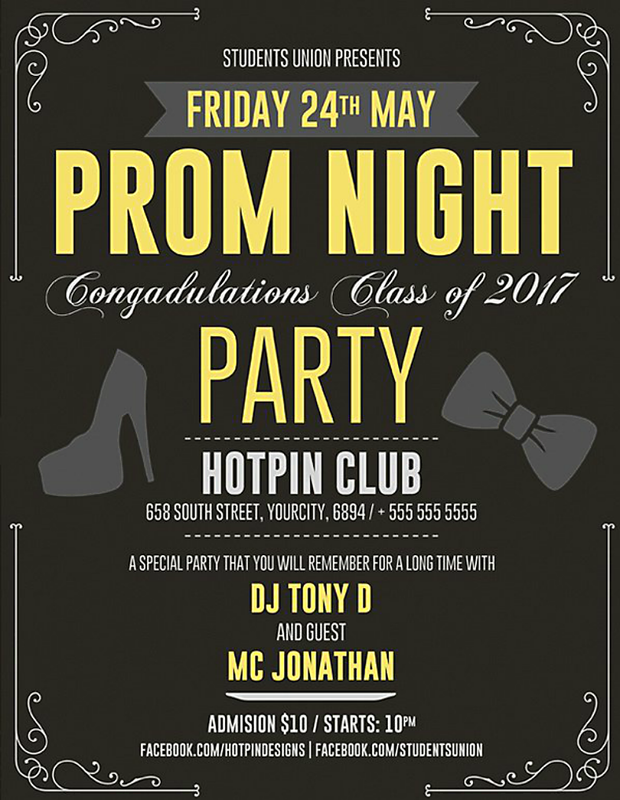 The pre-prom event can help you get into the mood while the post-prom event will allow you to continue the celebration minus the formality. 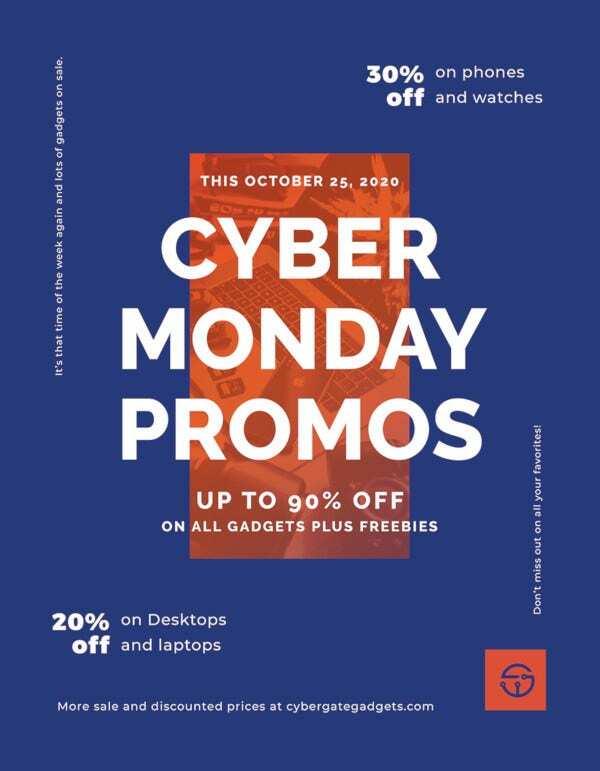 You may also see abstract flyer templates. 3. Since you are already close so bidding goodbye to your school and your teachers, DO take the time to thank and talk to them during prom night. It may be a very simple thing to do, but showing a bit of gratitude and appreciation is a lot meaningful than you would expect, you may even be remembered by your teachers even after you graduate. You may also like free flyers. 4. Prom night wouldn’t be a perfect prom night if there weren’t any dramas happening. For some unknown reason, various conflicts occur during prom night such as friends fighting or couples breaking up. But whatever happens, DO NOT ever get yourself into any drama or do not let anyone get on your nerves. Prom is about having fun, so have fun regardless of what’s happening around you. You may also see design flyers. 5. As much as you would want to enjoy the night with your closest friends and with the person that you like, but be sure to always have the presence of mind and DO NOT be careless. Be smart and always take responsibility not only for yourself but also for the people around you especially your friends. In other words, be safe and look after each other if you want to continue enjoying the night. You may also see printable flyer templates. 6. And when having fun, make sure to also be comfortable in your attire. DO NOT wear something that is uncomfortable. You may be dancing a lot, and you may have a lot of activities during the post-prom event, so it is very important that your attire and shoes allow you to be able to move without any restrictions. You may also see printable invitation flyers. 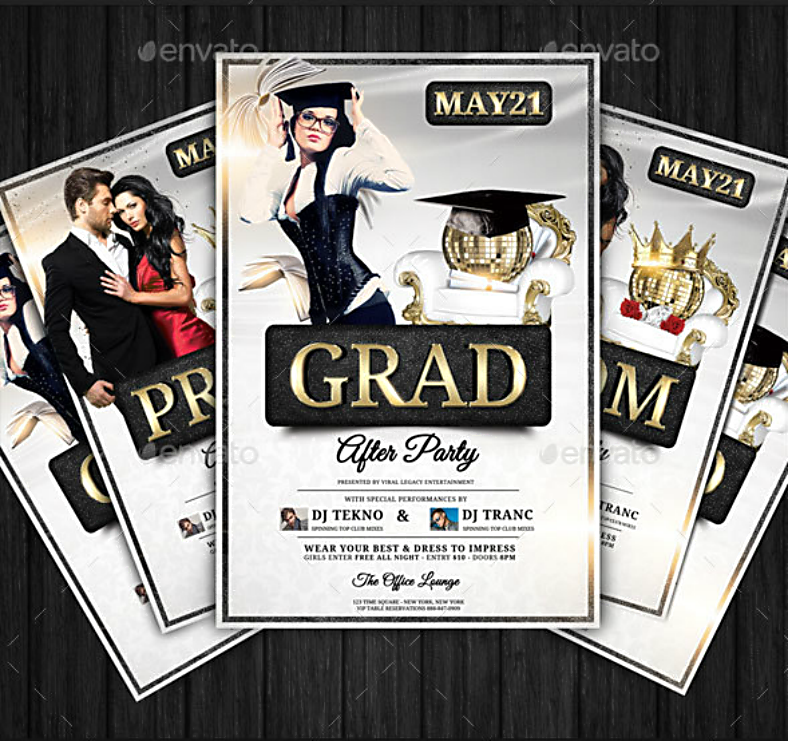 Above is a multi-purpose flyer template that you can use for both prom events and graduation after parties. 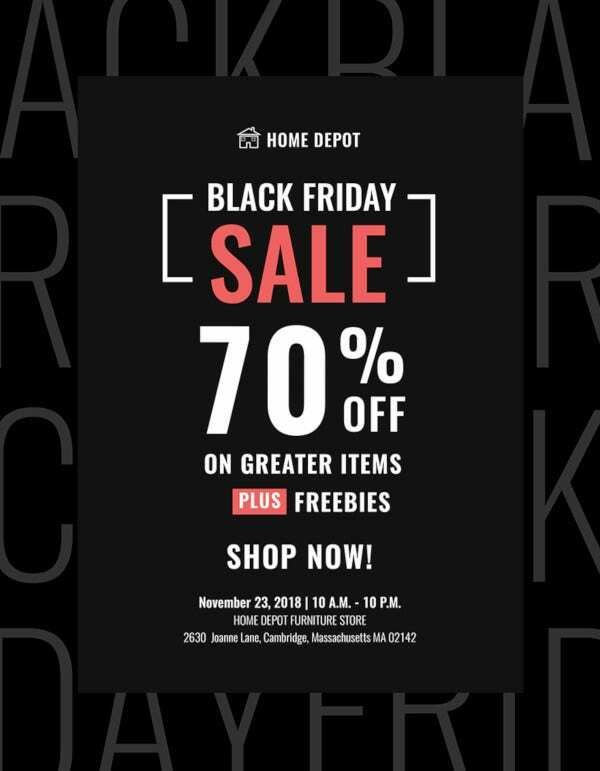 For as low as $8.00, you will already be able to get your hands on high-quality flyer templates that you can use for more than just two purposes. Above is another heavily typographic prom party flyer design which you may also find interesting, but unlike the previous one that you have seen, this one features a more minimalist theme with flat elements. Additionally, this template features a solid, dark background to make the entire design easier on the eyes as well as to make the elements stand out from its background. 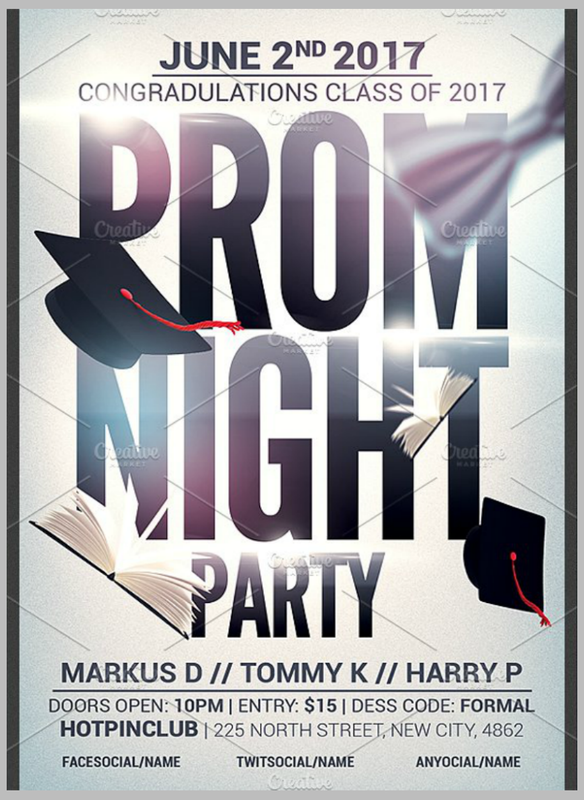 Why Use Flyers to Promote Prom Night? Prom is just like any other event, and we already know that an event will be able to gather the desired number of attendees if it is being promoted very well. 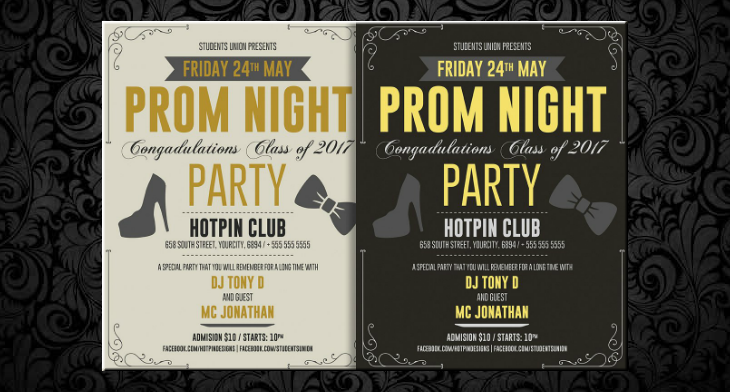 With regards to flyers, they have since been proven to be an effective tool for advertising businesses, products, and events, which makes it just as appropriate when it is used to promote a prom night. The beauty with flyers is that it actually initiates contact between the person promoting the event and the passerby who is being invited to participate, unlike posters which are simply stuck on the wall without any interaction between persons. But as mentioned earlier in this article, if you still wish to have something attached to the wall and wait for it to be noticed by passersby, you may be allowed to do that with modern flyers. 1. 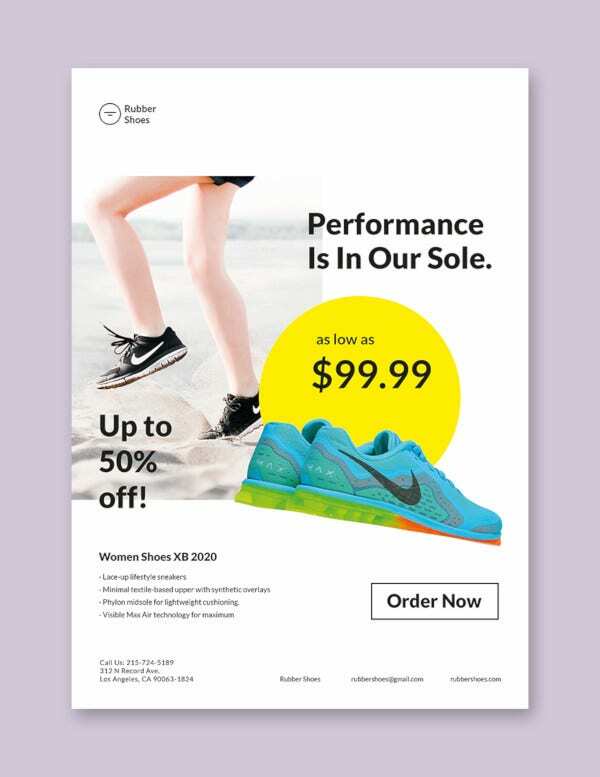 Relying too much on the presentation or the flyer design itself is not at all enough to increase the effectiveness of your flyer distribution, the manner in which the flyer is being distributed matters as well. We have mentioned it many times already with regards to the use of flyers, and that it promotes a connection between the advertiser and the prospect. So, when handing out flyers, make sure to connect with the person you are handing it to. 2. Plan out your sites ahead of time, and by sites, we mean the location wherein you will be handing out flyers. You can’t just go to a random place to distribute flyers, the location is an important factor since you will need to consider the heaviness of passersby that go through that particular site. Good examples would include malls and subway stations, but in this scenario, the ideal sites where you should do flyer distribution would include the canteen and the main entrance to the school. You may also see printable event flyers. 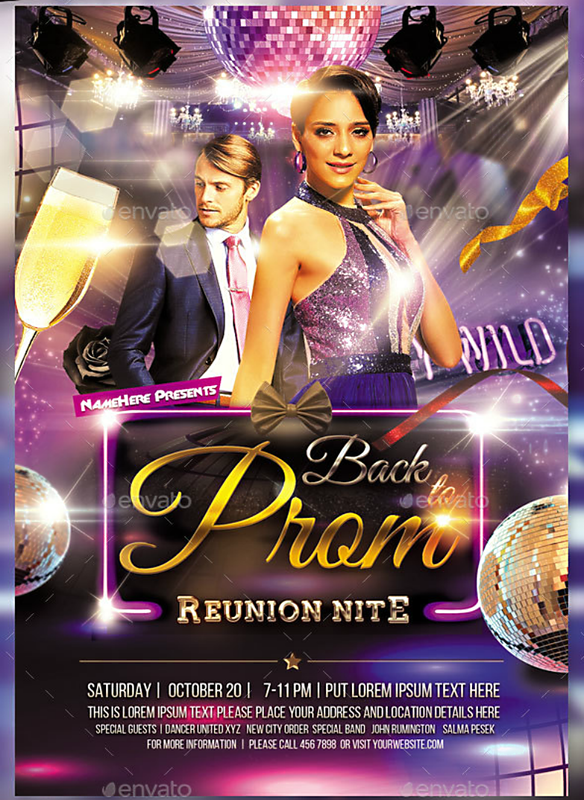 Above is another typographic prom flyer template which leans more towards textual elements, but unlike the previous templates that you have seen, this one makes use of a creative background. This flyer template features a good view of the night sky filled with stars. Even though with all those elements in the background, the textual elements are still able to stand out effectively. 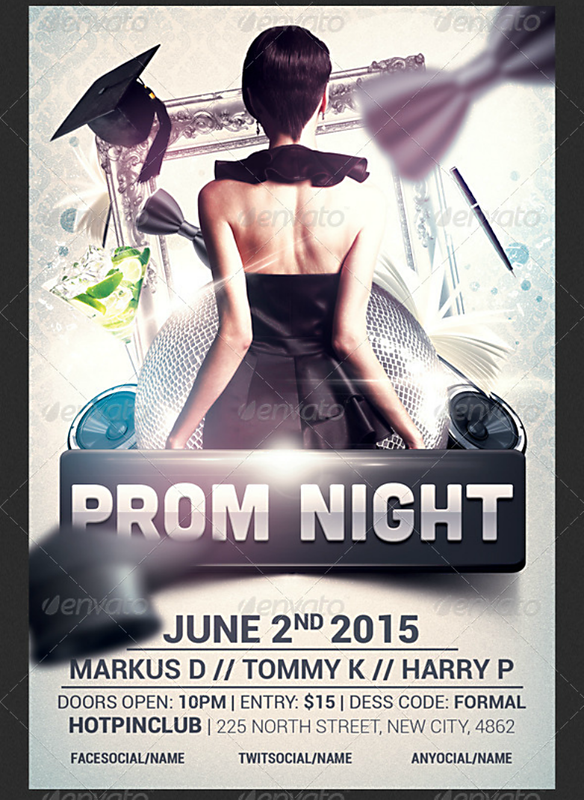 Are you planning for a more modern theme on your prom night flyer template? Then why not check out the template above? It features two people which seem to be the prom king and queen of the night. Are you all set for the prom night that you are organizing? 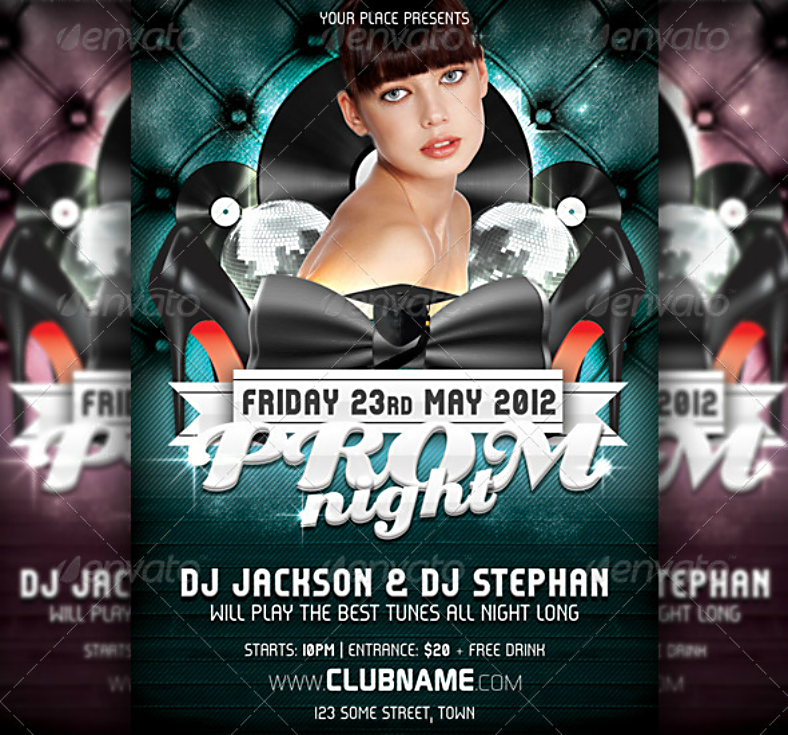 If you are, then you better start downloading at least one of the flyer layout templates that you have just seen. However, if you still need some convincing as to why you should choose our templates, then don’t stop here. You probably didn’t know it, but these flyer templates were actually professionally-designed by some of today’s best graphic artists from all over the world, and we had to go through piles of templates from various sources just to be able to bring you the flyer templates that you need. If you were wondering whether or not you are allowed to make modifications to these templates, of course, you are able to, and you don’t even have to be concerned about the quality since these templates are capable of preserving their sharpness regardless of much editing and resizing you apply on them. 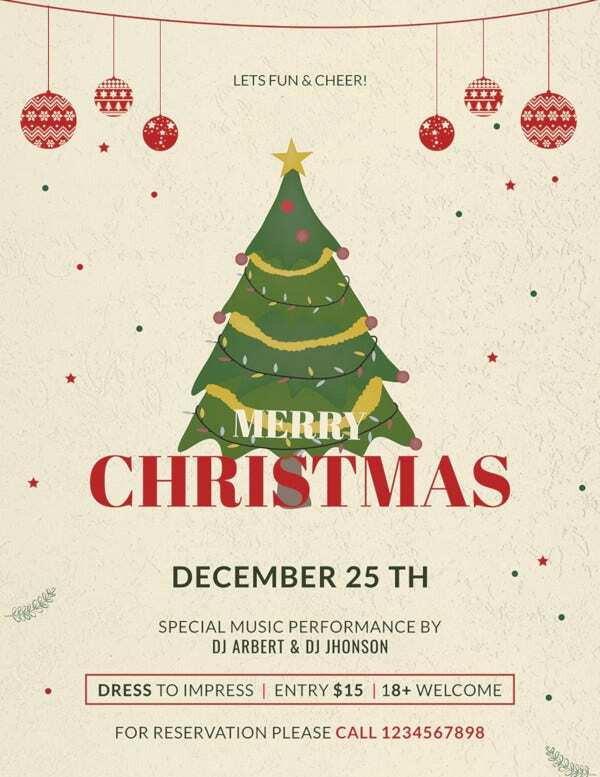 And finally, with regards to the amount that you will need to spend to download these template, you actually don’t need to spend a lot to be able to get your hands on these party event flyer templates, just a reasonable amount to give credit to the artists behind it. We hope that information helped convince you that our templates are indeed worth downloading because time is running out, and you better get yourself busy by clicking on that download button so you can start making your prom night flyers.